As always, theft from vehicles is the most prevalent crime. Please don’t leave valuables in your car. The City of Houston is usually 3 or more months behind in releasing monthly crime stats. To stay more current, about once a week I monitor daily crime reports, and accumulate the data to arrive at the crime data presented here. For August: Robbery of business 2700 block of Houston Avenue. Auto thefts in the 2400 block of White Oak and the 1100 block of Usener. Our permanent night shift deputy has completed the 8 week training of his new police dog and we are pleased to welcome his return to duty in our neighborhood. We remind everyone that for a crime in progress, please call 911 first, principally because we do not have 24/7 deputy coverage. If our deputies are on duty, they should be monitoring those calls, though you can also call Precinct One dispatch after calling 911. Our deputies come to work in our neighborhood, and remain through their shift, unless they are called to respond to a nearby contract. The deputies spend their shift cruising the neighborhood. When they stop to look at something or take some action, they keep a log, so we have a general idea of their activities. 32 “Meet the Citizen” – this is basically a conversation with a member of the neighborhood in a fashion that’s not covered above, (e.g., to introduce themselves or answer a question). If you're reading this in our monthly newsletter please view this article on our website to view a bar chart showing crime statistics over the past three months. As always, theft from vehicles is the most prevalent crime. Please don’t leave valuables in your car. For July: Burglaries involved residences in the 100 block of Alma, 3700 block of Bradley, and 900 block of Woodland. Auto theft in the 3700 block of Bradley. The City of Houston is usually 3 months behind in releasing monthly crime stats. To stay more current, about once a week I monitor daily crime reports and accumulate the data to arrive at the crime data presented here. Hopefully, many of you got to meet our deputies at the July 4th parade. Our day shift deputy is waiting for it to cool off a bit before he gets back on his bike. Our permanent night shift deputy is about to complete his 8 week training course with his new police dog. During his training several other deputies are covering his shift, and as always we receive support from surrounding contracts (Heights, Garden Oaks etc.). It is common for deputies from nearby contracts to respond to calls in our area as Precinct One endeavors to provide prompt service when we call. 37 “Meet the Citizen” – this is basically a conversation with a member of the neighborhood in a fashion that’s not covered above, (e.g., to introduce themselves or answer a question). Our deputies are very service oriented, so if you see a deputy and have a question, or just want to say hello – flag them down. We are at 418 subscribers, which is a bit above where we were at this time last year. Including our reserve, at this level of participation we can continue with two patrols through at least March 2017 – possibly longer. To sustain two patrols indefinitely, we need to get long-term participation at or above 465. As has always been the case, we will continue to add subscribers throughout the year so we may get there yet. We continue to consider other ways to reach out and increase participation. If you haven’t joined, please consider doing so. If you are already a member, please don’t hesitate to talk up the program with neighbors who aren’t members. 58 times they stopped and talked to folks in the neighborhood not in relation to any particular call or problem, more in the nature of meet and greet. Numbers reflect total area covered by police beat #2A30 which includes Houston Heights, North Norhill/Proctor Plaza, Sunset Heights, and more. In April the most thefts occurred in streets (parked cars) and restaurant parking lots. There was only one theft from a residence. All three burglaries were of residences. Because the city takes several months to post this data cumulatively for an entire month, to stay more current we go in and extract this data manually, on a weekly basis. We're still perfecting our capture methodology and hope to offer meaningful comparisons of the data in the coming months. 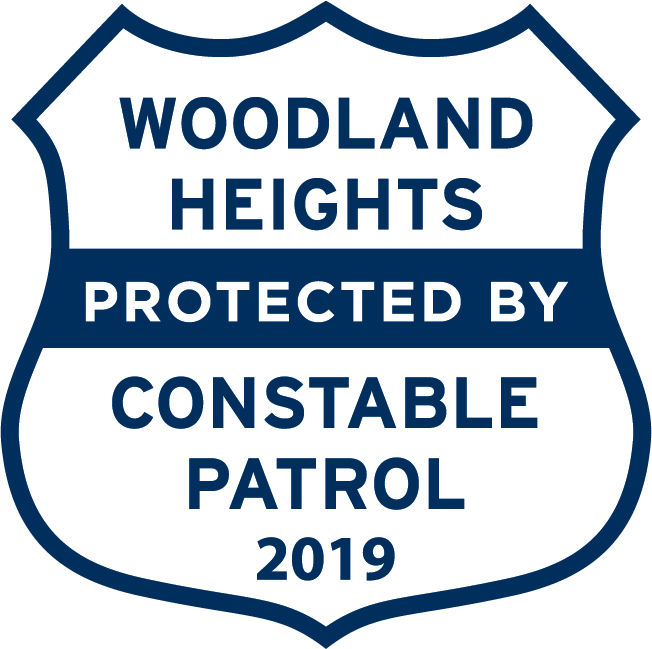 Our annual Constable Patrol renewal campaign is in the second month, and we are still short of the participation needed to continue to support two patrol shifts. We are reaching out to the neighborhood in various ways to obtain your support for the Constable Patrol. Even when our deputies are not on patrol, we get coverage from nearby contracts. Your new VP of Security's cat set off the house alarm last week shortly after one of our shifts had ended. Within 6 minutes of the alarm, deputies showed up from both the Heights and Garden Oaks contracts. The cat was let off with a warning. Spring is a time where we see more property theft involving yard-care equipment, and things like porch furniture. When working in the yard, don’t leave tools and equipment unattended if they are in sight of the street. Have electric garage doors but sometimes forget to close them? Check into something like the Garage Butler – an easy to install device that will automatically close your garage doors. 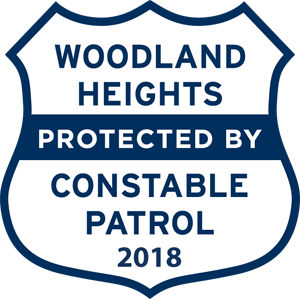 You can sign up to receive email or text crime alerts for the area by going to the Precinct One Constable’s website and going to Crime Alerts under the Sign Up drop-down menu. Let's all watch out for our neighbors, and keep our neighborhood safe.